Sometimes it’s the little things that make a car special. Small, yet important, details can make for a more manageable drive and create a more comfortable environment for you and your passengers. And from the automatic folding side mirrors to the heated steering wheel and the easy-to-use information interface, the new Volkswagen Touareg Hybrid has them in spades. The fully loaded 2011 model piles on features inside and outside the cabin to complement the beautifully redesigned interior and exterior. It makes sense, though, that the technology in this SUV is equally as high-tech as the hybrid powertrain, which uses a 3.0-liter supercharged V-6 engine in addition to an electric motor to generate power and efficiency when you need them and makes for an exciting drive. 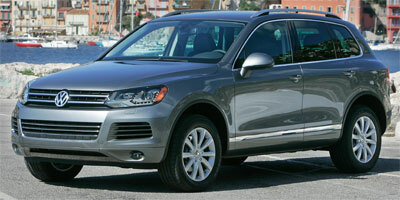 The Touareg Hybrid isn’t without its faults, however, despite the long standard feature list and stellar looks. The regenerative brakes are inconsistent, too sensitive when lightly braking and too dull when you need instant response. And all the tech in the world won’t convince some of the $60,000 price tag, which is thousands more than the base Touareg. And we hate to say it, but you’ll get better gas mileage out of the diesel version. The combination of a supercharged engine and electric motor makes for one fun-to-drive hybrid. Comfort level, visibility and spaciousness have been improved over the outgoing model. A stunning panoramic roof really opens up the cabin space. The touch screen interface is clean and simple and provides great access to the hybrid system’s information. Exterior design looks great, as does the interior space. Pricing is high. Very high. A standard Touareg starts at $44,000, and while the $16,000 jump does pack in every feature under the sun, a $60K-plus VW is hard to swallow. Not helping its cause is its gas mileage, which isn’t better than the more reasonably priced diesel version and only marginally better on the highway than the standard trim. Regenerative brakes give the pedal inconsistent travel and feel. 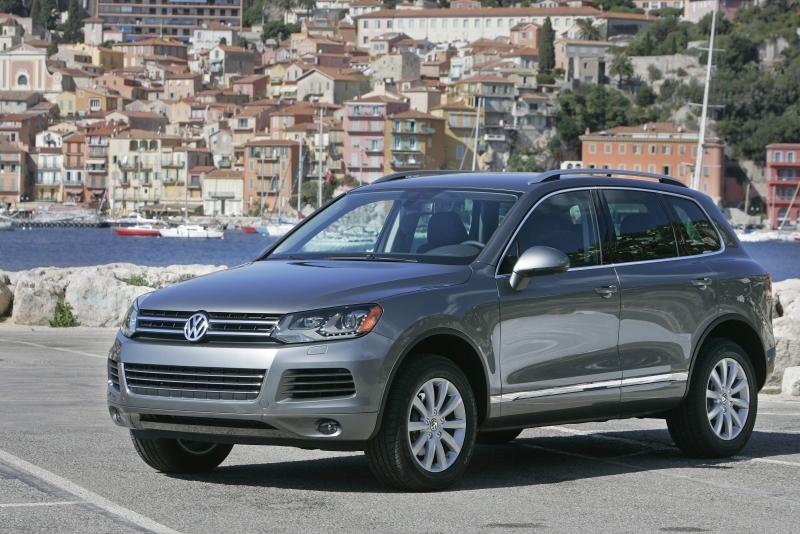 On one level, the Touareg is like many hybrids on the market. The electric motor allows you to drive up to 30 mph on battery power alone (although it requires an extremely light foot to do so), which creates a serene city driving experience. It will also cut the engine when idling or while coasting – a nice feature when you’re at speed on the freeway. But if you need even just a bit of power, the supercharged V-6 jumps in, adding significant acceleration and power, and ostensibly breathing new life into the drive. The transition of power between the two modes is a smooth one and, if it weren’t for the engine noise, a nearly unnoticeable one at that. If it could, the sport button would strip the hybrid badge from the exterior as it increases rpm and gives you more on-demand power. 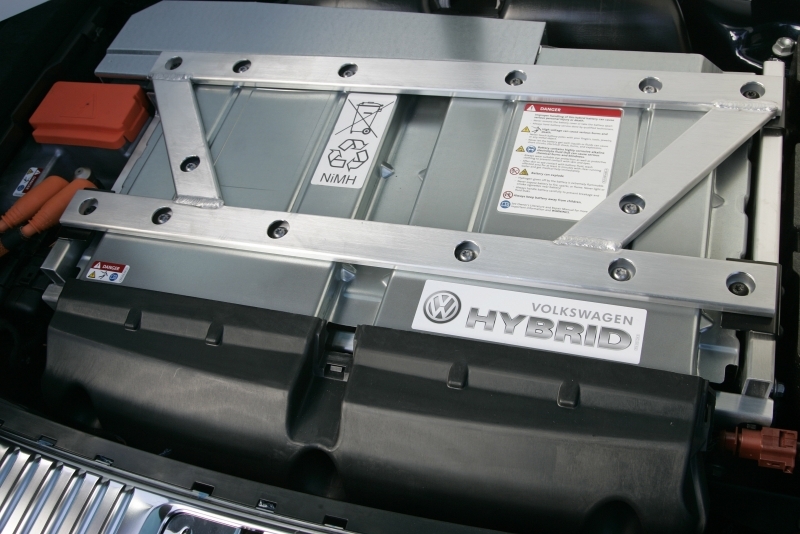 The only downside of the hybrid system is the regenerative braking system. It’s used to help recharge the battery while you’re slowing down, but produces inconsistent pedal travel and feel. Steering is direct, if a little disconnected, and the 4Motion all-wheel drive system makes trips to the mountains a breeze. Adding some extra oomph to the typical hybrid drive is a 3.0-liter supercharged V-6 engine combined with a 288-volt battery and electric motor. Together they produce 380 horsepower and 428 lb-ft of torque, and power is sent to all four wheels through Volkswagen’s 4Motion all-wheel drive system. 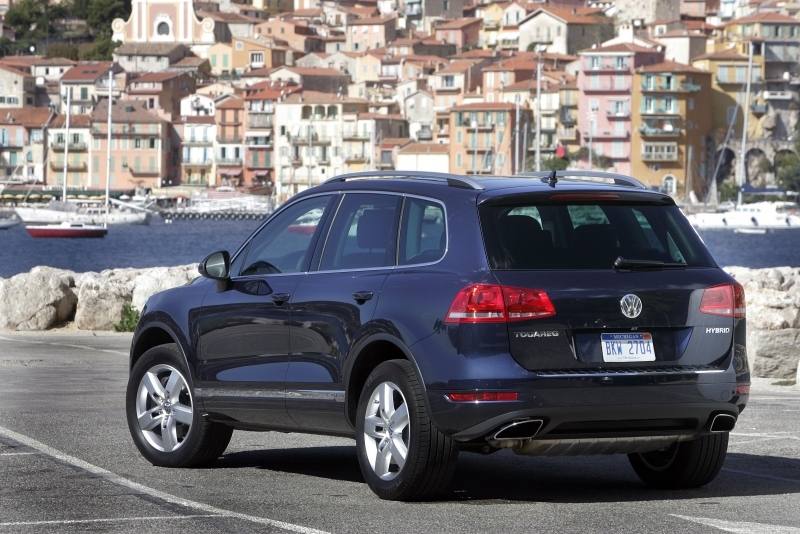 The Touareg Hybrid comes standard with an eight-speed automatic transmission with Tiptronic shifting and sport mode. This trim is loaded with absolutely everything on offer from Volkswagen. Really, the only option you’d pay extra for is a trailer hitch. In a world of power everything and leather seating a few standouts are evident, such as the rearview camera and park assist, supple 12-way adjustable front seats, heated steering wheel, one-touch liftgate access and automatic folding side mirrors. Rain-sensing windshield wipers and heated rear seats are perfect additions for those living in cold climates. A 620-watt Dynaudio sound system is also standard. The Touareg Hybrid’s cabin is a lesson in technology integration done right. Between the two gauges is a brilliant multi-function screen that allows you to control navigation, telephone, audio and car settings through steering wheel-mounted buttons. The central touch screen is also user friendly. Standard Bluetooth connectivity is seamless and streams audio as well. While hybrid tech means that this SUV is considerably more fuel-efficient around town than its V-6 counterpart (20 mpg versus 16 mpg respectively), the highway numbers are far less impressive, with the Hybrid receiving 24 mpg – just one more than normal. The real winner in the Touareg lineup is the TDI version, which returns 28 mpg highway. The interior of the Touareg Hybrid is as upscale as you’ll see from this brand. Everything’s included: heated leather steering wheel, Burr Walnut trim and metallic accents. The panoramic roof is a show-stopper, brightening up and further modernizing the cabin. Heated seats are standard throughout the cabin, and there’s more room now to spread out. For 2011, the Touareg loses the boxed out front lights and streamlines the sheet metal, using sweeping lines to create a less top-heavy look. The nose has been replaced with Volkswagen’s new front-end, found on all the updated models. Most noticeable is its migration toward its sibling’s (the Porsche Cayenne) styling, and considering the Cayenne is the breadwinner for the Porsche marque, that’s not a bad thing at all. Pricing is this VW’s Achilles’ heel. While the Touareg Hybrid starts (and ends) at $60,595 and comes fully loaded, a TDI version starts at $47,950 – up from the base model’s $44,450. It’s hard to plead a case for that sort of increase, especially when the competition starts at $51,800 for the BMW X5 xDrive35d and $55,790 for the Mercedes-Benz ML450 Hybrid. At this price, even the Porsche Cayenne S Hybrid ($67,700) is a competitor. The Touareg Hybrid is a fantastic car – there’s little denying that – and by purchasing one you’ll get every option you’ve ever wanted (and some, perhaps, that you didn’t) inside and outside the cabin. The supercharged engine adds some much-needed spark to a hybrid’s drive and city mileage numbers will be rewarding. But if you love the Volkswagen Touareg Hybrid and are balking at the price, it makes a lot of sense to check out their diesel version. You’ll save a few thousand dollars and get better fuel economy too.